**Now includes "Deep Sleep" as a Bonus Track! Get the total determination to reach your goals, be proactive, and become super motivated with this guided meditation program, from certified hypnotherapist, Joel Thielke. It's as easy as turning on the tracks and falling asleep! The Sleep Learning System is specially designed to work with your subconscious mind during your sleep cycle. The guided meditation and soothing background music will deeply relax your body and mind for the perfect night's sleep, while allowing you to access the deepest parts of your mind. With this program, get motivated and focused to reach your goals with total determination. Two inductions give you options for each session, or listen to the entire album. It's your choice! You'll feel well rested and energized when you wake up, and with every time you listen, you will feel motivated and focused on taking steps towards success. Joel Thielke's guided mediation system gives you positive suggestions that will help you quiet your mind and melt away stress, leaving your body deeply relaxed for a great night's sleep. While you're sleeping, the program will get rid of limiting beliefs and help you embrace self-motivating, positive beliefs that will keep you focused on success and keep you taking steps towards your goals. The special inductions will gently guide you into your REM stage of sleep, working with your subconscious to make lasting change that you can see. This Sleep Learning System album comes with two extended tracks that include the Sleep Induction and Garden Induction, guided meditation programs, and bonus music and positive subliminals, providing hours of relaxation for your listening experience. 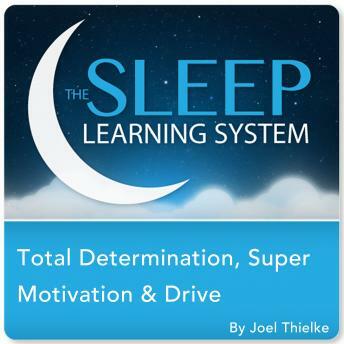 Tapped into your total determination with The Sleep Learning System!